A new blue, gold and white colour scheme for Portsmouth's Spinnaker Tower has been unveiled. The city council sold the naming rights for the next five years to airline Emirates in a five-year deal bringing in £3.5 million, which was announced two weeks ago (5 June). The company's name will be displayed on the exterior of the tower, which was to be partly repainted in their brand's colour red. But there was an outcry against what was seen as Southampton FC's colours. Following an online petition against the colour scheme that reached 10,000 supporters, Conservative leader of the local authority Donna Jones has announced a review of the plan to better reflect the city's own football team, the Royal Navy and local heritage. "The design, which reflects the city's rich maritime heritage, as well as Emirates' distinct branding, will feature a new blue, white and gold colour scheme. "As part of an exclusive five-year partnership worth £3.5 million, Emirates will be the first ever sponsor of the famous Portsmouth landmark, which from July 2015, will be renamed the Emirates Spinnaker Tower. 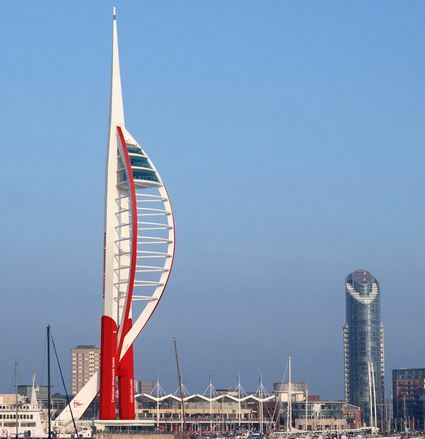 "The new design, which has been based on the collective feedback from the local Portsmouth community following the partnership announcement on the 5th June, will see the bottom 50 metres of the tower take on a distinctive blue, with Emirates gold on the legs and back of the tower, whilst the iconic Spinnaker sails will remain white." "We have listened to the public and created a new blue, gold and white design that is in keeping with suggestions from residents. This means we can move forward with the partnership with Emirates that will bring in £3.5m to support services for our residents, and gives us a unique opportunity to promote Portsmouth around the world. "I want to thank everyone who took the time to send us their suggestions for the design. There were lots of calls for blue because of Portsmouth's association with the colour, something I understand having lived in the city all my life, and there was a lot of support for the inclusion of Emirates' gold in the design. We listened to those residents who told us they love the Spinnaker as it is, which is why the distinctive sail will remain white." "We take our responsibility as a sponsor very seriously. We listened to the feedback and worked with the Council to adapt the designs in order to create something that Portsmouth residents will be proud of. This is an exciting time for the city. The eyes of the world will be tuning in to watch the forthcoming America's Cup World Series, an opportunity to showcase the very best of Portsmouth. We are looking forward to joining the residents in the celebrations. "As a business, we have been committed to the United Kingdom ever since our first flight into London in 1987. We have invested heavily in the country through both our nationwide operations and our sponsorship portfolio of UK sporting institutions. This partnership is an extension of our commitment to the UK and we are proud to be in a position where our Emirates branding can sit alongside such an iconic British landmark." "I also want to thank Emirates for working with us to create the new design for our great city. The base of the Emirates Spinnaker Tower will now be painted a striking blue in time for the America's World Cup Series in July." Advertising consent is required and an advertising consent application is in process. The application can be viewed via the planning portal on Portsmouth City Council's website.